With sun and temperatures getting into the low 80s even in northern Wisconsin snow is now finally gone from the entire state. Ice went out on many lakes last weekend and went out this week on Trout Lake in Vilas County. Loons returned to the lakes as soon as the ice went out and could be heard calling once again. High temperatures and full sun allowed many anglers to enjoy the fishing opener and arrive home with a suntan or sunburn. Many anglers were out on the Menominee, Peshtigo and Oconto rivers with mixed success. Anglers were out on Green Bay with some launches almost full during opener on Saturday. Most boats were catching three to five walleyes but some were harvesting limits. Anglers fishing the Fox River for white bass found themselves putting fewer than a dozen fish in the bucket. All ramps are now ice free across Door County. Action is picking up in the Sturgeon Bay area with walleye anglers getting some action from shore and out in the bay. Brown trout action has been decent between Sturgeon Bay and Egg Harbor. Anglers fishing Lake Michigan off Kewaunee and Algoma reported success for brown and lake trout. Anglers targeting brown trout and coho salmon out of Milwaukee found some success. The Menomonee River continues to have fishing pressure but very few steelhead were being seen or caught. This year's sturgeon spawning run on the Winnebago System is over and went fast. The warm temperatures last week condensed the spawning activity. The fish were spawning in large numbers at all of the traditional spawning sites but it lasted only about a week. Turkeys are nesting and turkey hunters are reporting good success but many birds are responding to strutting tom decoys rather than calling. Multiple goose broods and ducklings are being seen and a sandhill crane colt was reported this week. Deer fawns are starting to be reported. Again a reminder that if you see a fawn alone, please leave it where it is as the survival strategy for deer is to leave the nearly scent free fawns "hidden" while the doe feeds somewhere nearby but the mother will return to retrieve the fawn after feeding. Boreal chorus frogs, leopard frogs, wood frogs and spring peepers have been deafeningly loud on some of the warm evenings. Bees, mosquitos, ticks and other insects awakened with the warming temperatures. Large numbers of white-throated and other sparrows arrived this week and the warbler migration is at or very close to peak with birders reporting outstanding diversity and numbers. Bird hikes and birding events are being held at many locations this weekend and in coming weeks. Marsh marigolds, Dutchman's breeches, hepaticas, bellwort, spring beauties, trout lily, trilliums and blood root are blooming, or starting to bloom in the south but flowers are just starting to emerge in the north. Wild leeks - or ramps - and fern fronds are up. And morel mushrooms are being reported in southern Wisconsin with the warmer temps and rain. Statewide fire danger ranged from Low to Very High this past week; 88 fires burned 156 acres in DNR Protection Areas; 12 buildings were destroyed and another 30 were threatened, but saved with firefighter assistance. The main wildfire causes this week were debris burning and equipment. The largest fire of the week burned 27 acres in Langlade County, caused by a campfire. People are urged to continue to use caution with all types of outdoor burning, ash disposal and equipment use. Property owners are reminded to remain present when burning debris in a barrel or on the ground - should your fire escape, you can be held responsible for the cost of fire suppression and any damages resulting from the escaped fire. Clear an area around the pile or barrel and make sure a hose is attached to a working spigot. Wet down the burned area before leaving. Stay aware of the current fire danger for your area by checking our website: dnr.wi.gov, keyword "fire." May 14 marks the fifth anniversary of the Germann Road Fire that burned 7,442 acres and 100 buildings (including 22 homes and cabins) in Douglas County. After a great start to the month, birding remained fantastic across most of the state this week. The north saw its first rose-breasted grosbeaks, Baltimore orioles, gray catbirds, house wrens, ruby-throated hummingbirds, bobolinks, upland sandpipers, and various warblers. Thrushes moved in too, including hermit, Swainson's, gray-cheeked, wood, and veery. Stealing the show, however, were the sparrows. Large numbers of white-throated sparrows have arrived, joined by excellent numbers of white-crowned and Lincoln's sparrows, swamp sparrows, and above-average numbers of Harris's sparrows. Flocks of Bonaparte's gulls foraged over open water bodies, which at long last welcomed returning common loons as well. May 9 saw a good migration of shorebirds, dominated by lesser yellowlegs but also featuring at least 10 other species such as pectoral and solitary sandpipers, willets, dowitchers, semipalmated plovers and more. Broad-winged hawks continued to fill the skies, although their migration is now waning. Warbler migration is likely at or very close to peak across the south, where birders from Milwaukee to Green Bay and Madison to La Crosse reported outstanding diversity and numbers. Many were found foraging lower than a typical year and thus offered especially spectacular views. 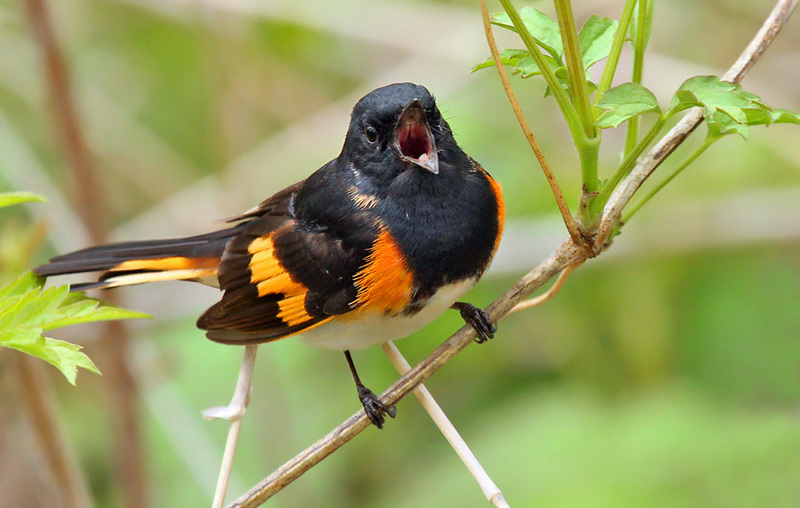 Baltimore orioles, rose-breasted grosbeaks, and ruby-throated hummingbirds continue to adorn feeding stations, now joined by good numbers of indigo buntings. Ruby-crowned kinglets were abundant earlier in the week, while a couple olive-sided flycatchers and common nighthawks made somewhat early arrivals. American avocets at several locations were among the most noteworthy shorebirds. Kinnickinnic State Park - Wild Food Rambles! Peninsula State Park - Like to Hike: Nicolet Trail via "Shanty Bay"
Willow River State Park - Geocaching in the Park! May 11, 9 a.m.-noon, Ridgeway Pine Relict: Pulling or spraying garlic mustard - Ridgeway features towering cliffs of pine with northern plant species underneath and extensive oak savanna. Help the Friends of Ridgeway Pine Relict, Inc. care for this site by removing invasive plants and planting native plants. Workdays are once a month on the second Friday. We will be removing garlic mustard by pulling or spraying. May 12, 9 a.m.-noon, Bluff Creek State Natural Area: Removing invasives - Come enjoy spring weather and help volunteers during our monthly Southern Kettle Moraine SNA workdays on the second Saturday. Enjoy a short hike and find blooming flowers. We may split up and travel to different sites (Clover Valley Fen, Whitewater Oak Opening, etc.) depending on weather conditions. Activities may be girdling aspen, spraying garlic mustard, or cutting and piling brush. All to improve the quality of these great sites. May 16, 9-noon Rocky Run State Natural Area - Help out at Rocky Run and learn something in the process. Rocky Run is a priority site because it is large, has rich sand prairie and oak savanna, and rare plants and animals live there. We are expanding the good areas by removing pine plantations, brush, and spreading native seed. We may be using herbicides to spray knapweed and brush or we will be piling slash in a pine plantation. Horicon Marsh State Wildlife Area - Migrating birds have arrived including warblers, grosbeaks and orioles. Celebrate Mother's Day Weekend with the Birds at the Horicon Marsh Bird Festival. Bird enthusiasts can experience the sights, sounds and natural beauty of birds in peak spring migration as the Horicon Marsh Bird Club hosts the 21st annual Bird Festival at Horicon Marsh Education and Visitor Center May 10-14. From the backyard birder to the world traveler, four days of adventure awaits by foot, boat, bus and bicycle at Horicon Marsh, one of the largest freshwater marshes in the United States. The Horicon Marsh Bird Festival is the oldest bird festival in Wisconsin. Highlights of this year's Bird Festival include a keynote speech from birder and humorist Al Batt; 'Mom and Me, Birding Together', a beginner's guide to birding (and a great way to spend some time with mom on Mother's Day) and bird banding demonstrations by Dr. Sheldon Cooper from UW-Oshkosh. Good air quality for Wisconsin on Wednesday, April 24, 2019 at 9:28 pm CT.